Japanese Episode AG 108: "Abusoru! Shinobi Yoru Wazawai no Kage"
American Episode 379: "Absol-ute Disaster!" As our heroes continue through Izabe Island, they become startled when the bridge they're walking on collapses! The residents of a nearby village attribute the accident to Absol, a pokemon blamed for a recent string of disasters in the area. A young boy in the village named Noboru disagrees and sets out to find his older brother Satoru, who had left some time ago to capture the pokemon. Masato and the others believe Satoru and decide to follow him. Before long, Absol appears, and soon after a geyser bursts from the mountain's side and threatens to push Noboru, Masato, and Pikachu off the mountain! Absol jumps in and saves Noboru and Satoshi's Ohsubame is able to save Masato, but nobody is able to get to Pikachu in time! Suddenly, a Heracross belonging to none other than Satoru swoops in and rescues Pikachu! Noboru's older brother tells our heroes that he's been researching the Absol and has determined that they try to help people get out of disastrous situations instead of creating them. Takeshi guesses that the burst of water from before is the sign of a bigger flood coming and, soon enough, his theory is proven when water starts gushing toward the village! 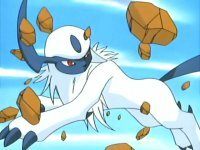 Absol spots a boulder on a cliff that's big enough to stop the flow of water, so it combines its power with that of our heroes' pokemon to move the boulder into position. The village is saved, and the villagers finally realize the truth about Absol. This episode doesn't really stick out all that much. While it is nice to see people hating Absol so much just because everyone in the show usually has this obnoxious "aLL poKayMOn aRe oUr FREndZ!" attitude, but at the end of the day it's still a rather lackluster episode. The dub is a little bit different because 4Kids actually adds footage to this episode (not in the Pokemon 4Ever way), in addition to removing it. Other than that, Team Rocket's jokes are worse than usual, and Absol still has that sucky voice it had in the Jirachi movie. Two seconds are cut from the episode's title screen. Then, a second is cut from the shot immediately following the title screen. A second is cut from the shot of the broken bridge after Max says "Or, maybe the Absol's not to blame. How do we know it destroyed the bridge?" And the establishing shot of Riyado Village is shortened by a second. So in the dub, we see Nicky holding on to the tree limb, he lets go, everyone screams after him, and then we see the Trainer's Choice for the episode. Then, after the commercial break, we see the exact same footage repeated before Nicky falls and is rescued by Absol. In the Japanese version, there was no commercial break at this part, so the footage was only shown once. Three seconds are removed from the pan-down shot of the village after Kids' WB! 's final commercial break. And...my tape cuts off before the TO BE CONTINUED.. screen, so I couldn't tell you how much that shot was shortened by. So let's just assume that two seconds were cut out and leave it at that.